Features of the Vigor3200 series Multi-Subnet security routers will satisfy the network requirements of small to medium business networks. Its Multi-Subnet interface with Multi-VLAN function allows users to easily divide network into different sections based on applications, such as VoIP, web or ftp server or user groups, such as Sales, Technical Support or HR dept. Each usage/application or user group can get its dedicated bandwidth and administrator can have security control between user groups for preventing possible data leakage. All these 4xGbps WAN ports support current xDSL/Cable/Satellite broadband and the USB port also allows connection to the 3.5G Mobile Broadband. The WAN ports can be configured to increase data throughput, backup each other (Failover mode), or share the traffic (Load Balance). If you have your own Web server, FTP server and mail server, the 4 WAN ports will provide additional bandwidth for customers. In addition, the 1xGbps LAN port switch compatible with PoE switch (e.g. VigorSwitch P2260) and Gigabit switch (e.g. VigorSwitch G2080/G2240) can support large data transfer and connect to multiple client devices (PC/servers) in small to medium LAN networks. Vigor3200 series embedded with tag-based multi-subnet function can maximize the investment of your obtained bandwidth. For example, you can allocate your 100Mbps broadband connection(s) to timing critical applications such as VoIP, web or ftp severs and business essential departments such as Sales and Technical Support team. You additional low monthly fee DSL or cable line can be used by mail server or HR team which don’t need fast data/voice packet transmission for daily operation. SMB can get highly cost-effective and secure network as adopting Vigor3200 series. 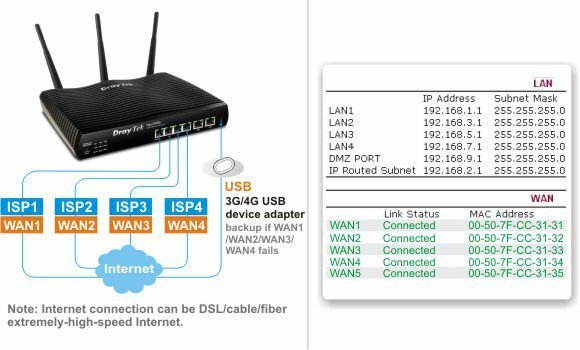 The capability of the USB port to connect to 3.5G mobile broadband means that the router can be used in anywhere with 3.5G coverage, such as moving vehicles, temporary events, offices where xDSL or Cable are not available, etc. Apart from supporting printer servers, the USB port also allows the connection of a USB disk or hard drive for FTP file transfer through the Internet or local networks. The network administrator can set username/password and directory/file access privilege for individual users. The DMZ port of Vigor3200 series can provide additional layer protection to servers, such as Web server, which need to expose resources from untrusted network: e.g. Internet but also have uncompromising internal LAN security requirements. Through the user-friendly WUI of Vigor3200 series, admin can activate DMZ by NAT or Physical mode to the chosen server. That would makes external attacks only have access to the external-facing equipment in the DMZ, not entire LAN to insert extra layer of protection to SMB’s internal network. With all this connectivity, your LAN and WAN increases in complexity, but the comprehensive VLAN and QoS enables your efficient utilization of your bandwidth on your LAN and WAN side. The 802.1q VLAN is supported on both the LAN and WAN ports. By applying 802.1q VLAN tagging, the marked packets will be transmitted together and split further along in your network topology, as required, or merely dropped/ignored if they fall outside a device’s VLAN settings. The Quality of Service (QoS) allows you to give specific traffic types or clients different levels of priority when it comes to transmitting data so that the most appropriate amount of total bandwidth is reserved for the most important data. The VLAN groups and QoS (802.1p & TOS/DSCP Methods) can be combined with QoS rules for transmission to the Internet. After you set up VLAN groups for your office network, you can define firewall rules together with VLAN groups to let remote VPN links to only access the specific LAN ports. 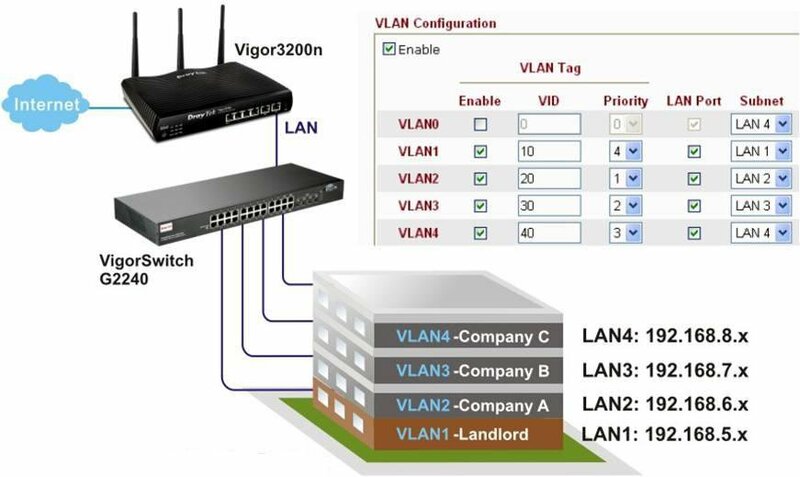 The Vigor3200 series are with four LAN subnets which are very useful for multi-tenanted applications or where there is necessity of department segmentation. The VLAN setup can be applied to the four LAN subnets for isolated connection. For example, you are running a public web server on your network. The VLAN segmentation with different subnets will give a fully isolated connection to the said public web server. 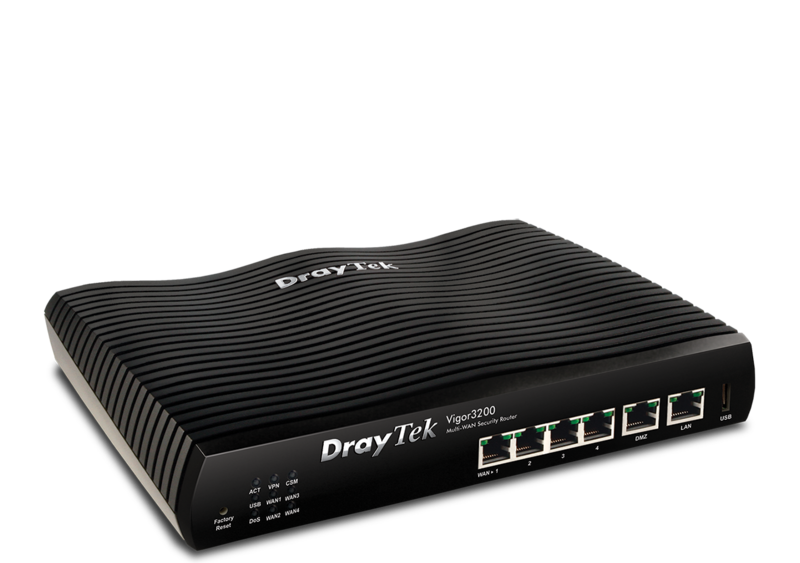 The Vigor3200 series offer you robust firewall options with both IP-layer and content-based protection. The DoS/DDoS prevention and URL/Web content filter strengthen the security outside and inside the network. The enterprise-level CSM (Content Security Management) enables users to control and manage IM (Instant Messenger) and P2P (Peer-to-Peer) applications more efficiently. The CSM hence prevents inappropriate content from distracting employees and impeding productivity. Furthermore, the CSM can keep office networks threat-free and available. The “User Management” implemented on your router firmware can allow you to prevent any computer from accessing your Internet connection without a username or password. You can also allocate time budgets to your employees within office network. Up to 64 simultaneous hardware based VPN tunnels are supported providing a throughput up to 40Mbps. Each of these can be configured to use any of the common VPN protocols: PPTP, IPSec, L2TP, L2TP over IPSec, etc., and with any of the most up-to-date encryption (MPPE, AES/DES/3DES), Authentication (MD5, SHA-1), Pre-shared Key, Digital Signature (X.509). These tunnels can be used for LAN-to-LAN or remote dial-in. The Vigor3200 series support up to 64 concurrent VPN tunnels for LAN-to-LAN and remote access. There are up 10 concurrent tunnels of SSL Web Proxy and SSL Applications on Vigor3200 series for teleworkers. 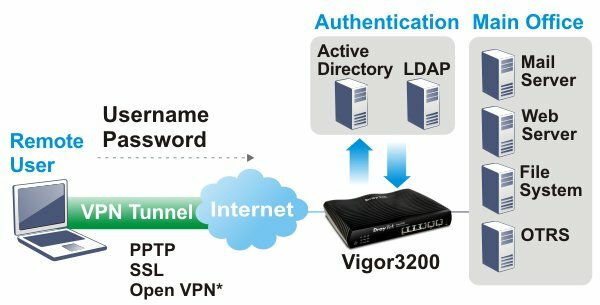 Along with Ethernet WAN ports, the VPN trunking (VPN load-balancing and VPN backup) are available on Vigor3200 series. 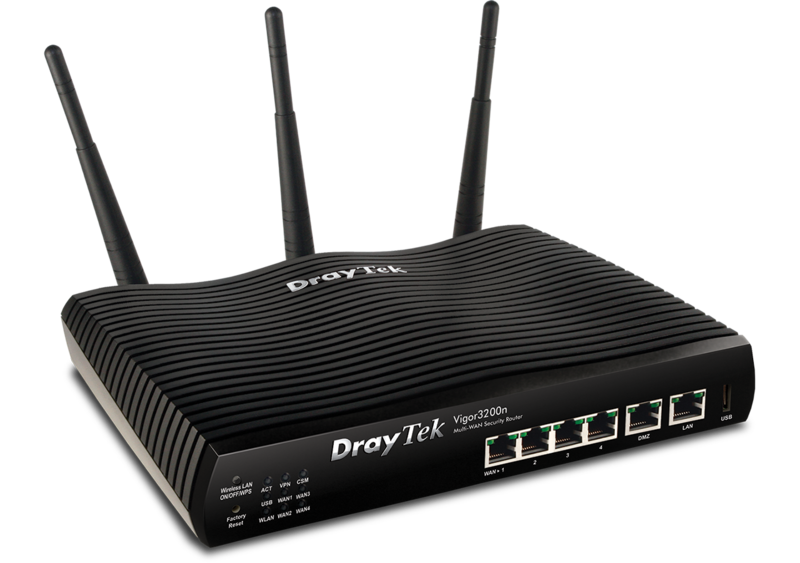 The Vigor3200n model includes a built-in 802.11n Wireless Access Point (WAP) delivering wireless network speed up to 300Mbps. For upmost security, it supports WEP/WPA/WPA2 (64bit/128bit), MAC Address Access Control, 4 x SSID, 802.1x Authentication and WLAN Isolation. Other enhanced features include: WDS (Wireless Distribution System) to extend the coverage range, Wireless Rate Control to manage bandwidth allocation to wireless devices, and WMM (Wi-Fi Multimedia) to prioritize voice, video and data within the WLAN network. 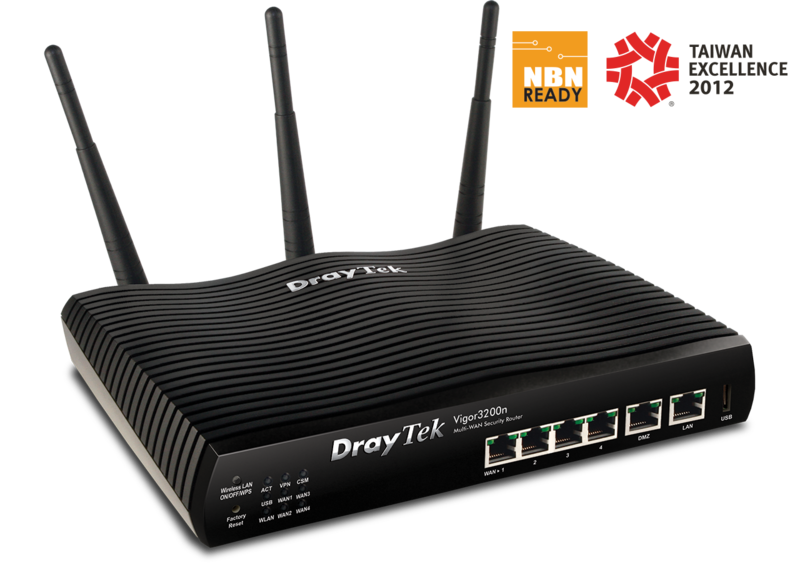 DrayTek makes authentication for VPN Remote Access with ease by Vigor3200 Series. Network administrator doesn’t have to create new Remote Dial-in User Profiles for authentication mechanism but applies existed user accounts saved in the external server (e.g. Active Directory/LDAP). 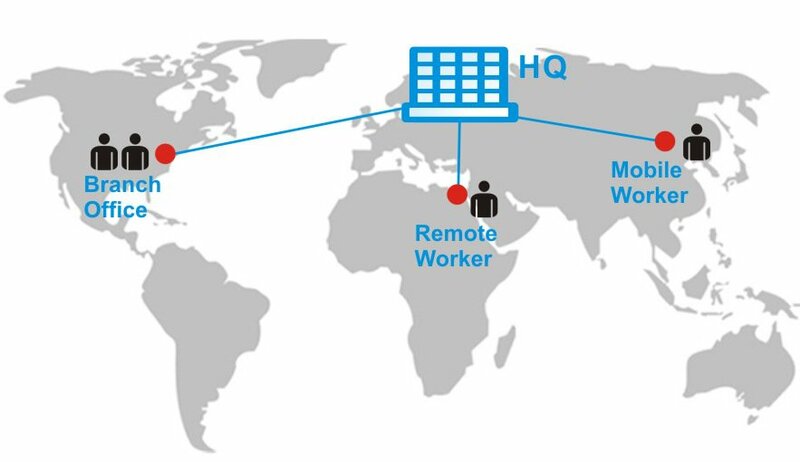 This enhancement significantly saves the time of IT Dept while establishing the secure remote access network for tele-workers. More features are available to support business networks’ operations, such as Call Scheduling, RADIUS support, UP&P, VLAN, QoS, Packet Forward Acceleration, etc. The version 3.3.7 firmware of Vigor3200 supports 100-Node DrayTek Smart Monitor Traffic Analyzer which enables you to analyze in great depth your Internet traffic, as a professional aid to improving efficiency and detecting potential problems.